Not exceeding 30 years as on normal closing date. Not exceeding 35 years for Scheduled Castes and Scheduled Tribes candidates, not exceeding 33 years for Other Backward Classes candidates in respect of vacancies reserved for them. Bachelor's’ degree in Technology/Engineering in Biomedical Engineering or Chemical Engineering or Biotechnology or Mechanical or Electrical Engineering or Electronics or Instrumentation Engineering or Polymer Engineering with Two years’ experience in manufacturing or testing or regulation of medical devices or in research or designing. 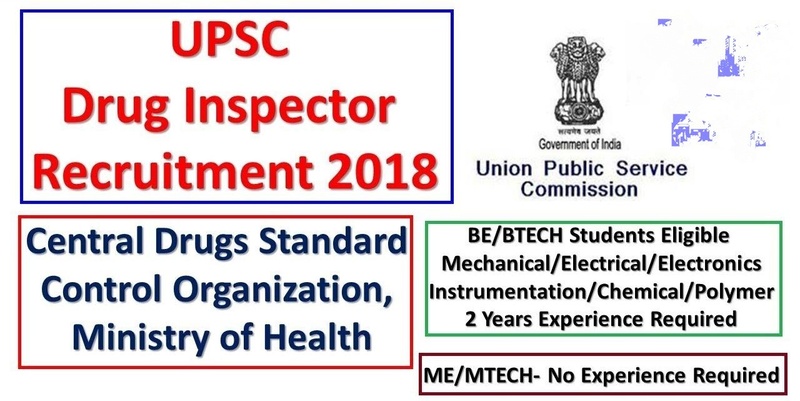 Note 1: Qualification are relaxable at the discretion of the U.P.S.C., for reasons to be recorded in writing, in the case of candidates otherwise well qualified. 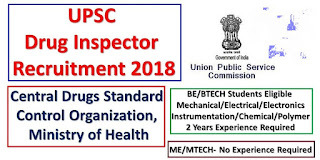 Note 2: The qualification(s) regarding experience is/are relaxable at the discretion of the U.P.S.C., for reasons to be recorded in writing in the case of candidates belonging to Scheduled Castes or Scheduled Tribes if at any stage of selection the U.P.S.C., is of the opinion that sufficient number of candidates from these communities possessing the requisite experience are not likely to be available to fill up the vacancies reserved for them. (iv) to maintain a record of all inspections undertaken, drawing of samples, review of technical dossiers, Launch of prosecution, seizure of stocks, investigate of complaints. Head Quarter : Central Drugs Standard Control Organization, New Delhi with all India liability. i) Candidates must apply online through the website upsconline.nic.in. Applications received through any other mode would not be accepted and summarily rejected. ii) Candidates must upload the following documents/certificates relating to educational qualification, Date of Birth, Experience (preferably in the prescribed format), Desirable Qualification(s) or any other information, as claimed in the online application.